This weekend will bring a deep freeze that could prove fatal for the ill-equipped across the Midwest. States such as Illinois, Minnesota and Wisconsin will see lows in the minus teens and minus 20s. And with sub-zero winds whipping through some areas, it could feel more like the minus 50s and minus 60s, meteorologists warn. The Weather Channel warned that “one of the coldest arctic air masses in nearly 30 years” was likely to hit the Plains and Midwest this weekend. 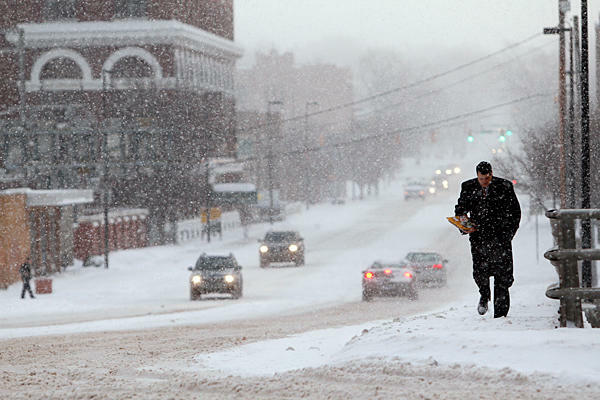 Some all-time cold records appeared to be in jeopardy, forecasters said. Snow is expected to begin falling throughout the Midwest on Sunday, also reaching parts of Tennessee and Alabama. Along the East Coast, the storm will bring rain but be accompanied by warmer weather. Minnesota isn’t taking any chances on Monday. Governor Mark Dayton said all public schools will be closed for the day. Minneapolis will see a high of minus-14 degrees and a low of minus 27 degrees through Monday – but with the wind chill it would feel like the minus 40s. “The safety of Minnesota’s schoolchildren must be our first priority,” Mark Dayton said in a statement. Temperatures won’t be any better in Chicago, which will come close to a high of minus 11 degrees – a record mark previously reached in December 1983 and January 1994. Perhaps the most foolhardy will be football fans in Wisconsin. Sunday’s NFC wild-card game between the Green Bay Packers and the San Francisco 49ers will play out in bone-chilling minus-5-degree temperatures. Meanwhile, cities across the mid-Atlantic to the Northeast will see milder temperatures with rain Sunday into Monday. New York City will see highs in the lower 40s. Boston, digging out from as much as two feet of snow, could reach 50 degrees. While airports in the areas hardest hit by Friday’s big storm still grappled with some residual flight problems, less than 800 into or out of the U.S. had been canceled as of 11 a.m. ET Saturday, according to FlightAware. More than 2,600 flights into or out of the U.S. were canceled by midday Friday. While the next wave of northeast weather might not affect air travel, another frigid plunge is forecast for Tuesday: New York City is expected to see a high of around 10 degrees, while Philadelphia and Boston will be in the teens.